It was an important day for Nadigar Sangam as the foundation stone for the new building was laid today, the 31st March at Habibullah Road, T Nagar, Chennai. 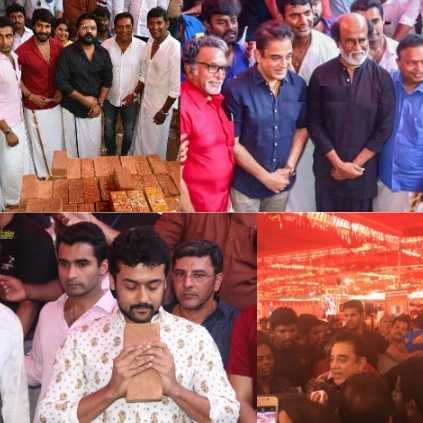 It was attended by many artists such as Rajinikanth, Kamal Haasan, Nasser, Vishal, Suriya, Simbu, Simran and others. Superstar Rajinikanth and Ulaganayagan Kamal Haasan graced the occasion which was a great boost to the community. Apparently, Vishal and Karthi together had donated 10cr for Nadigar Sangam building foundation laying ceremony. It was earlier reported that Kamal and Rajini would inaugurate the function by keeping the first stone for the building. But since Kamal returned from London around 11.30 AM, he was able to participate only a little later. People looking for online information on Kamal Haasan, Nadigar sangam, Nadigar Sangam foundation stone, Rajinikanth, Vishal will find this news story useful.